My turnabo ut interview with Steven L Sears had an amazing download; 48, 712 and I had such a wonderful interview with Steven L Sears chatting about Entering My Second Half. He asked perfect questions during our interview, ; The Tables Are Turned interview; http://tobtr.com/s/8077789 . We talked about my family, my ambitions to be an actress, and the amazing people I have met on the way. And he tied together Different is Beautiful with Entering My Second Half solely due to my own life experiences. 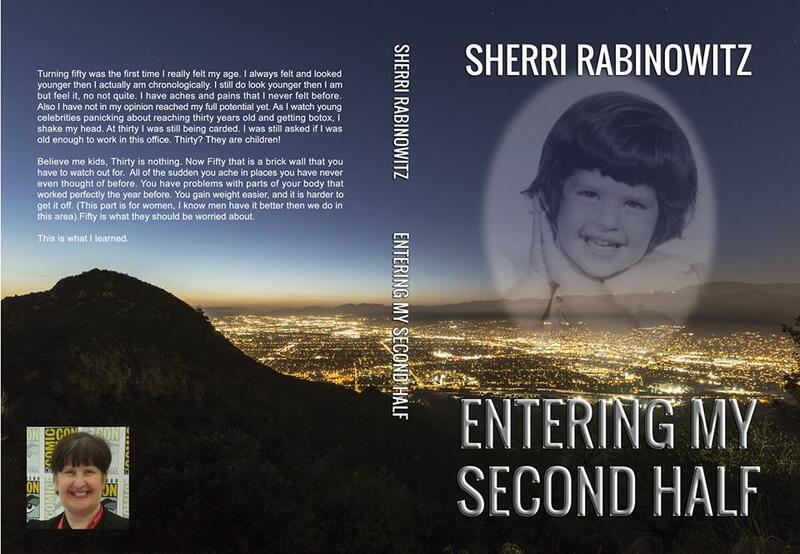 You can buy the paperback of Entering My Second Half at; http://www.amazon.com/Entering-Second-Half-Sherri- rabinowitz/dp/1500513180/ref=pd_rhf_dp_p_img_2?ie=UTF8&refRID=0J13WA2AGFMFK9W4DX2E and the ebook at; http://www.amazon.com/dp/B015T985JO/ref=cm_sw_r_tw_dp_I0alwb18W40ZM and you can buy Different is Beautiful; http://www.amazon.com/review/R1GDK8T0U448K1/ref=cm_cr_dp_title? Meanwhile I am still working on my latest project, the new edition of Fantasy Time inc. , the audio book is now in its final stages so I am going through the proofs of the paperback and e-book editions. Once these are out you will no longer be able to purchase the first edition via anything but this blog and my new website when it is complete. So anyone who does own the first edition it just went up in value a bit 🙂 The cover for the new edition above was created by the talented Anja Gruber, she also created the cover for Different Is Beautiful. I had a lovely time chatting on Chatting With Sherri with author Josh Vogt about his books, writing, his transition to editing! It was a lot of fun, please give it a listen; http://tobtr.com/s/8047555 . Live radio plays, New editions of books, Producing Chatting With Sherri, you can’t accuse me of being idle? Meanwhile I am still working on my latest project, the new edition of Fantasy Time inc. , the audio book is now in its final stages so I am going through the proofs of the paperback and e-book editions. Once these are out you will no longer be able to purchase the first edition via anything but this blog and my new website when it is complete. So anyone who does own the first edition it just went up in value a bit 🙂 The cover was created by the talented Anja Gruber once more, she also created the cover for Different Is Beautiful. Entering My Second Half by Sherri Rabinowitz; What follows are fascinating bits and bobs of my life. The things I have done, the people I have met, the places I have been. I have re-written the goals of my life and these experiences helped me formed them. As I write this I began to realize I have led a hell of life! http://www.amazon.com/dp/B015T985JO/ref=cm_sw_r_tw_dp_I0alwb18W40ZM You can receive an Authorgraph from @rithebardfor “Entering My Second Half” http://agr.ph/r/49fc27a8 I have two interviews coming up this month for the book and one will be very unusual, I will tell you more as we get closer the first interview will be at the end of the next week and the unusual one will be the following week, I can’t wait!